Alternative approaches make it possible to minimize damage to facilities, bodies of water, and plant life while ensuring safety. As another winter approaches, snow and ice removal likely will be top of mind. These days, the environmental costs of traditional snow and ice removal methods are a growing concern. The chemicals often used to melt snow and ice can damage buildings and pavement, and the run-off can harm plants and bodies of water. To be sure, the chlorides or salts currently used by many facility professionals to melt snow and ice likely will remain around for some time. Many are familiar with their use. In addition, salt typically requires less upfront investment than some other options. At the same time, more facility managers are considering ways to adjust traditional snow and ice removal methods to reduce their impact on the environment. They’re also looking into new options that are entering the market. “As buildings have become more sustainable, facilities professionals now are thinking more about their environmental impact outside the building,” says Nate Clemmer, chief executive officer with SynaTek Solutions. One starting point sounds rather obvious: measuring the amount of salt used to avoid over-applying it. Another option is replacing granular salt with salt brine, which can dramatically cut the amount of salt needed to melt snow and ice. Facility managers can also consider potassium formate, rather than chlorides, to de-ice. These snow removal methods require different techniques and offer different cost/benefit equations than more traditional approaches. While it may be some time before they fully catch on, as the environmental costs of traditional snow and ice removal tactics become more apparent, more facility managers likely will consider alternatives. Of course, old-fashioned shoveling also can remove snow and ice with minimal impact to the environment. In addition, facility owners are understandably concerned about potential slip-and-fall accidents that can result from snowy parking lots and sidewalks. Indeed, many snow removal firms are compensated according to the amount of salt they put down, under the theory (not always accurate) that disbursing ever-greater amounts of snow removal chemicals will reduce this risk. “Contractors say, ‘We’re required to make it crunch,’” says Lee Gould, executive director with Smart About Salt, an organization dedicated to protecting freshwater from winter salt. To be sure, safety must be a priority, Gould adds. He notes that Smart About Salt hasn’t advocated eliminating salt as a chemical snow removal method. Instead, the goal is to use the least amount necessary to be effective. When chloride products, including sodium chloride (rock salt) and calcium chloride, run off into the water bodies, the compound breaks apart into ions as it dissolves, says Brie Welzer, environmental scientist with Green Seal. The increased presence of chloride ions changes the density in patches of the water, which alters the way the water moves. “There are many effects of the increased amount of chloride ions, and one of them is that the water doesn’t circulate as well, and this leads to anoxic patches where fish and other wildlife can’t survive,” Welzer says. Moreover, the problem grows worse each year. “There’s essentially no way or no fast and cheap way to reduce the levels of salt in our rivers,” Welzer says. In fact, Gould notes that the Ontario River in Canada has been home to a population of marine crabs normally found in salt water. “It gives you an idea of salinity of the river,” he says. 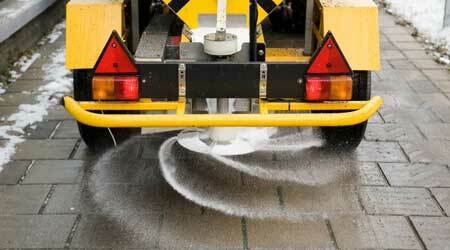 Somewhat counter-intuitively, safety also can be a concern when salt is over-applied in an effort to melt snow. Outside buildings, the overapplication can keep some granules from disintegrating. “It becomes like marbles on the pavement,” Gould says. What’s more, Clemmer says he’s hearing of a growing number of slip-and-falls inside, rather than outside, buildings. The reason, he says, is an overuse of magnesium chloride or calcium chloride, also salts used to melt snow. They tend to have an oily residue that can stay on peoples’ shoes and make glossy floors even more slippery. One starting step to a more environmentally friendly snow removal program is to better calibrate the equipment that spreads the salt, so only the amount needed is actually used. Sexton estimates that maybe 20 percent of snow removal professionals are able to measure how much they’re using. The others may use up to four times the amount needed. To be sure, this is an emerging practice. One obstacle is the expense. The truck-based salt spreaders that incorporate sophisticated controllers to measure salt application, not surprisingly, tend to cost more than those without, sometimes by a factor of four or five, says Daniel Gilleland, training manager with SnowEx. However, software is coming on the market that, while not as robust as the tools built into the machines themselves, also will be less expensive, Gilleland adds.